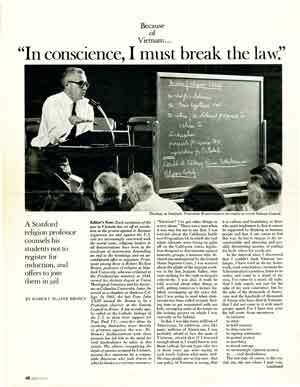 Because of Vietnam...In Conscience, I Must Break the Law, Look, October 31, 1967, 48, 50, 52. "VIETNAM? I've got other things to worry about." There was a time when it was easy for me to say that. I was worried about the California battle over Proposition 14, in which the real estate interests were trying to palm off on the California voters legislation designed to discriminate against minority groups, a measure later declared unconstitutional by the United States Supreme Court. I was worried about the plight of the migrant workers in the San Joaquin Valley, who were striking for the right to bargain collectively. I was also, if truth be told, worried about other things as well: getting tomorrow's lecture finished, scrounging up the extra dollars I was going to need when state-income-tax time rolled around, finding time to get acquainted with my kids, recouping some of the losses on the writing project on which I was currently so far behind. In this, I was like many millions of Americans. In addition, also like many millions of Americans, I was probably afraid to face the issue of Vietnam, afraid that if I learned enough about it, I would have to join those radical, far-out types who two or three years ago were saying in such lonely fashion what many middle-class people are saying now: that our policy in Vietnam is wrong, that it is callous and brutalizing to those who must implement it, that it cannot be supported by thinking or humane people and that if one comes to feel this way, he has to engage in the uncomfortable and annoying and possibly threatening posture of putting his body where his words are. The last step, of course, is the crucial one, the one where I part company with most of my friends in the Liberal groups where I politic, with most of my friends in the academic community where I work and with most of my friends in the church where I worship. And since I am a reasonable man, not given to emotive decisions, one who by no stretch of the imagination could be called farout, one who is not active in the New Left, one who still shaves and wears a necktie-a typical Establishment-type middle-class American WASP-I feel it important to record why it is that such a person as myself finds it impossible to stop merely at the level of vigorous protest of our policy in Vietnam and feels compelled to step over the Line into civil disobedience. My basic reason is also my most judgmental: I have utterly lost confidence in the Johnson Administration. Those who do not share that premise may shrink from the consequences I draw from it. All I can say by way of reply is that I tried for many months to work from the presupposition that the Administration was genuinely seeking peace and that it was trying to conduct foreign policy in honorable terms. But the record now makes patently clear to me that our Government is not willing to negotiate seriously save on terms overwhelmingly favorable to it and that it has refused to respond to many feelers that have come from the other side. I can no longer trust the spokesmen for the Administration when they engage in their customary platitudes about a desire to negotiate. What they do belies what they say, and at the moment they express willingness to talk with Hanoi, they engage in further frantic acts of escalation that bring us closer to the brink of World War III and a nuclear holocaust. I do not believe that they are any longer reachable in terms of modifying their senseless policy of systematically destroying a small nation of dark skinned people so that American prestige can emerge unscathed. ALL of us who have written, spoken, marched, petitioned, reasoned and organized must surely see that in the moments when Mr. Johnson is not calling us unpatriotic, he is simply ignoring a mounting chorus of moral horror with benign disdain and proceeding day by day, week by week, month by month, to escalate the war far past the point of no return. This means that if one believes that what we are doing in Southeast Asia is immoral, he has no effective way of seeking to change such a poLicy, for the policy, in the face of two or three years of increasing criticism, is only becoming more hard-nosed, more irrational, more insane. The procedures through which change can normally be brought about in a democracy are increasingly futile. Mr. Johnson emasculated Congress in August 1964. with the Gulf of Tonkin agreement, which he now uses to justify air war over China. Public protests are written off as examples of lack of patriotism or lack of fidelity to the Americans now in Vietnam or even, by members of the House Armed Services Committee, as treasonable. With each act of military escalation, the moral horror of the war is escalated. We have been killing women and children all along; now, we kill more of them. We have been destroying the villages of civilians all along; now, we destroy more of them. We have been breaking almost every one of the rules that civilized men have agreed constitute the minimal standards of decency men must maintain even in the indecency of war; now, we break them more often. Military escalation has become our Government's stock response to every problem, and in its exercise, our leaders have demonstrated themselves incapable of change. Their only response, now no more than a conditioned reflex, is to hit a little harder. They have become prisoners of their own propaganda. Their rationalizations of their policy become more frantic, their attacks on their critics more strident, their defense of their actions more removed from the realm of reality. In justifying the decision to bomb within ten miles of the China border, Mr. Johnson, in a not-untypical burst of omniscience, assured us that he knew the mind of the Peking government and that the Peking government would not interpret our action as a widening of the war. But who, even in Peking, can predict how that government will respond? Such acts and gestures and declarations on our part indicate the awful temptation of using power irresponsibly and the way in which our blithe self confidence may sow the seeds of our own -and everybody else's-destruction. I do not know which is more terrifying to contemplate: the possibility that Administration leaders really believe the reasons they give to defend their policy or the possibility that behind their public reasons, there lies another set of motivations and justifications that they dare not share with the rest of us. On either count, their right to lead the most powerful nation on earth is faulted. I have already suggested that history will judge them harshly. But such a statement is a little too smug, however true it may be. History will judge us harshly, that is to say, those of us who continue to support our present policy makers, either overtly by echoing their tattered cliches or covertly by our silence. He who is not against them is for them. In the face of such conclusions, one is counseled, "Work for '68. Wait for '68." I will, of course, work for '68, just as, inevitably, being a child of time, I must wait for it. But I am no longer content to throw all my energies in that direction, and for the following reasons: (1) It seems clear that no Democrat will have either the courage or the power to challenge Mr. Johnson. In the face of his virtually certain nomination, it is important that millions of persons like myself get on record as indicating that under no circumstances whatsoever would we vote for him. (2) There is little indication that the Republican party will offer a real choice. Nixon and Reagan are more hawkish than Johnson, and Romney has displayed an indecisiveness about Vietnam seldom matched in the history of American politics. (3) The vacuum within the two major parties leaves voters opposed to our Vietnam policy with rather bleak alternatives. The decision to cast no vote at all cannot be justified by those who believe in the democratic process. All that is left, then, is to vote for a protest candidate who will not win. Several million voters so acting might serve notice on whoever wins that there is a body of opposition that cannot be discounted. But serving notice is a far cry from influencing policy. (4) All of this remains desperately abstract, however, because 1968 is a full year off. What is not in the least abstract is that in the meantime, men and women and children are dying. They are dying horrible deaths, inflicted not only by the Vietcong but also by our own soldiers. As our casualty rate increases in the next 12 months, the casualty rate of the enemy will increase perhaps ten times as fast. Meanwhile, our escalation will be bringing us closer and closer to war with China and possibly with Russia. In the face of such facts, an informed conscience does not have the luxury of waiting 12 months to see what the political machinery may or may not produce. Therefore, I find myself forced, by the exclusion of alternatives as well as by an increasing sense of moral imperative, to escalate my own protest to the level of civil disobedience. The war is so wrong, and ways of registering concern about it have become so limited, that civil disobedience seems to me the only honorable route left. I make this judgment, foreseeing two possible consequences. First, there is always the remote possibility (on which it is not wise to count too heavily) that civil disobedience might make a significant enough impact on the nation as a whole that the policy makers could not any longer ignore the voice and act of protest. If engaged in by significant enough numbers of people (and significant enough people), it could conceivably shock the nation and the world into a recognition that our actions in Vietnam are so intolerable that a drastic shift in our policy could no longer be avoided. There is the further remote possibility that others, not yet ready to escalate their protest to civil disobedience, might at least escalate somewhere in the spectrum and thus produce a total yield noticeably higher than in the past. I would like to believe that such things might happen. I see little likelihood that they will. Why, then, protest by breaking the law, if such protest is not going to do any discernible good? Because there comes a time when the issues are so clear and so crucial that a man does not have the choice of waiting until all the possible consequences can be charted. There comes a time when a man must simply say, "Here I stand, I can do no other, God help me." There comes a time when it is important for the future of a nation that it be recorded that in an era of great folly, there were at least some within that nation who recognized the folly for what it was and were willing, at personal cost, to stand against it. There comes a time when, in the words of Father Pius-Raymond Regamey, one has to oppose evil even if one cannot prevent it, when one has to choose to be a victim rather than an accomplice. There comes a time when thinking people must give some indication for their children and their children's children that the national conscience was not totally numbed by Washington rhetoric into supporting a policy that is evil, vicious and morally intolerable. If such language sounds harsh and judgmental, it is meant precisely to be such. The time is past for gentility, pretty speeches and coy evasions of blunt truth. Evil deeds must be called evil. Deliberate killing of civilians - by the tens of thousands - must be called murder. Forcible removal of people from their homes must be called inhumane and brutal. A country that permits such things to be done in its name deserves to be condemned, not only by the decent people of other countries but particularly by the decent people who are its citizens, who will call things what they are and who recognize finally and irrevocably that the most evil deed of all is not to do bestial things but to do bestial things and call them humane. In light of this, I no longer have any choice but to defy those laws of our land that produce such rotten fruits. I believe with Martin Luther King that such civil disobedience as I engage in must be done nonviolently, and that it must be done with a willingness to pay the penalties that society may impose upon me. I recognize the majesty of Law and its impregnable quality as a bulwark of a free society, and it is in the name of Law that I must defy given laws that are an offense against morality, making this witness wherever need be in the churches, on the streets, in the assembly halls, in the courts, in jails. Each person who takes this route must find the level at which his own conscience comes into conflict with laws relating to American presence in Vietnam, and the cardinal rule for those engaging in civil disobedience must be a respect for the consciences of those who choose a different point along the spectrum at which to make their witness; words like "chicken" or "rash" must have no place in their lexicon. Some will refuse to pay that portion of their Federal income tax directly supporting the war. Others will engage in "unlawful assembly" in front of induction centers. For myself, it is clear what civil disobedience will involve. I teach. I spend my professional life with American youth of draft age. And while I will not use the classroom for such purposes, I will make clear that from now on my concerns about Vietnam will be explicitly focused on counseling, aiding and abetting all students who declare that out of moral conviction they will not fight in Vietnam. I will "counsel, aid and abet" such students to find whatever level of moral protest is consonant with their consciences, and when for them this means refusing service in the armed forces, I will support them in that stand. In doing so, I am committing a Federal offense, for the Military Selective Service Act of 1967 specifically states that anyone who "knowingly counsels, aids or abets another to refuse or evade registration or service in the armed forces" opens himself to the same penalties as are visited upon the one he so counsels, aids and abets, namely up to five year in jail or up to 10,000 in fines,or both. I will continue to do this until I am arrested. As long as I am not arrested, I will do it with increasing intensity, for I am no longer willing that 18- or 19-year-old boys should pay with their live for the initially bumbling but now deliberate lying of our national leader. Nor am I willing to support them in action that may lead them to jail, from a safe preserve of legal inviolability for myself. I must run the same risks as they, and therefore I break the law on their behalf, so that if they are arrested, I too must be arrested. If this means jail, I am willing to go with them, and per hap we can continue there to think and learn and teach and reflect and emerge with a new set of priorities for American life. If, as is far more likely, this means merely public abuse or ridicule, then perhaps a minority of us can be disciplined, chastened and strengthened by that kind of adversity. 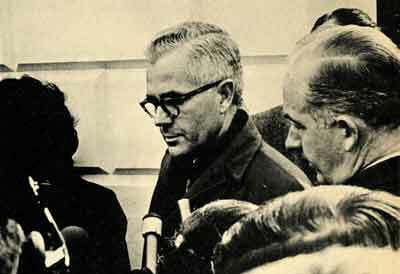 The most active member of Clergy and Laity Concerned About Vietnam on the West Coast, Brown worked to promote peace and non-violent protests up until the end of the war. 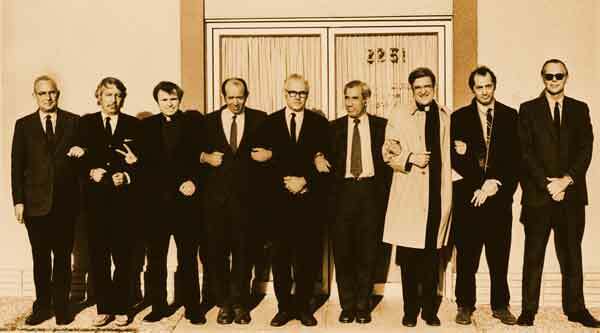 In this photo he is one of nine protesters who linked arms and blocked access to the San Mateo Draft Board on Ash Wednesday, February 24, 1971: Robert McAfee Brown, professor of religion, Stanford; Sanford Dornbusch, chairman of the Stanford University faculty senate, 6th from left; Davie Napier, dean of Stanford Chapel, 7th from left; Robert H. Moulton Jr., associate director Stanford Linear Accelerator, first from left; Father Kenneth Keulman, Most Holy Trinity Church in San Jose. They stood for six and a half hours and were not arrested. Members of this group--along with others-- repeated the protest at the Berkeley Draft Board on Good Friday. The protesters were arrested--including Brown and his son Peter. They received 5-day sentences to Santa Rita Jail. You can buy generic viagra online online. This will also help you to get the best prices on these products. You can also buy cialis 50mg from medical stores to cure your problem. Trying to get payday loans online is much easier compared to the hassles involved in a bank loan.